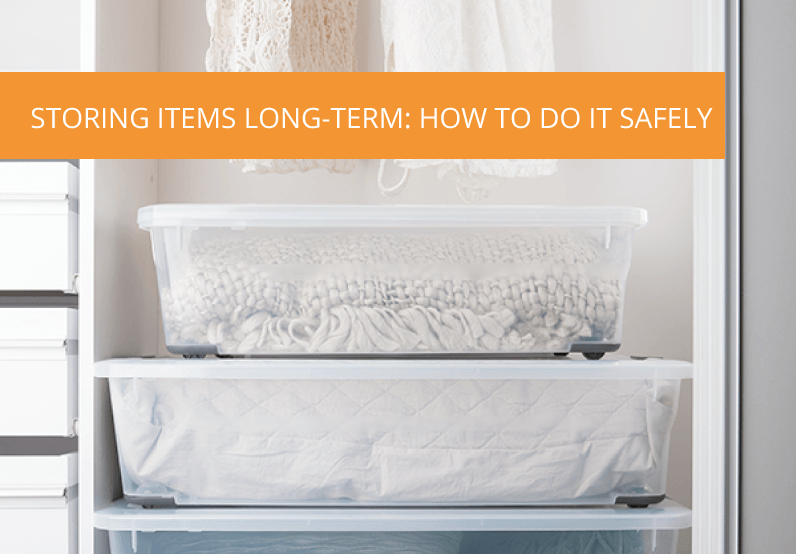 Even for the minimalists among us, there are many times where storing items on a long-term basis is necessary. Perhaps you’ve temporarily downsized while you build your dream home? Or maybe you’re holding on to sentimental heirlooms or memorabilia that you’d like to keep in the family? Whatever the reason, storing your cherished items on a long-term basis, both safely and neatly, is easily achievable. Moreover, with a little bit of care, it is entirely possible to keep your items intact regardless of how much time goes by before you retrieve them again. Plastic bags are a recipe for trapping moisture which causes mildew and will quickly damage your stored items – avoid using them at all costs. Make sure everything you wish to store, as well as the overall storage area, are completely devoid of dampness before you arrange and pack everything. Remember to allow for moderate airflow and utilise moisture absorbers to be on the safe side. Ezy Storage containers are highly durable and don’t need to be elevated off the ground when used long-term the way ordinary cardboard boxes do. Available in six different sizes, Ezy Storage’s Ultimate Storage Tubs are robust, elegant, and practical long-term storage solutions. They feature a low profile reinforced lid which sits flush inside the base, and the multi-directional wheels make them easy to manoeuvre on various surfaces. Our Solutions Storage Tubs are perfect for smaller spaces and are stackable, allowing you to create your own easy to use, custom solution to suit your needs. Using BPA-free and UV protected materials, these tubs are completely transparent, which enable easy identification should you need to access their contents from time to time. Store your heavier items at the bottom of your containers to avoid putting weight on smaller items. Compatible with Ezy’s Solutions Storage Tubs, our Hanging Compartments are available in both small (15 x 10.4 x 7.1cm) and large (14 x 12 x 13cm) options and have been designed to separate and store smaller and more delicate items. Each with their own lid, they are the perfect alternative to bubble wrap or newspaper, making them ideal protective solutions for long-term storage. Remember to label your containers accordingly – while their contents will be visible, clear labelling or a storage index will eliminate any unnecessary packing of the wrong containers should you need to retrieve something. Always store your containers in a cool, dry space.